I was recently invited to attend a MyPrinty social media event for bloggers sponsored by HP in New York City! The event was on a Sunday night, so my family and I decided to arrive Saturday morning and make a weekend trip out of it! (Who doesn’t want an excuse to spend a weekend in NYC?) 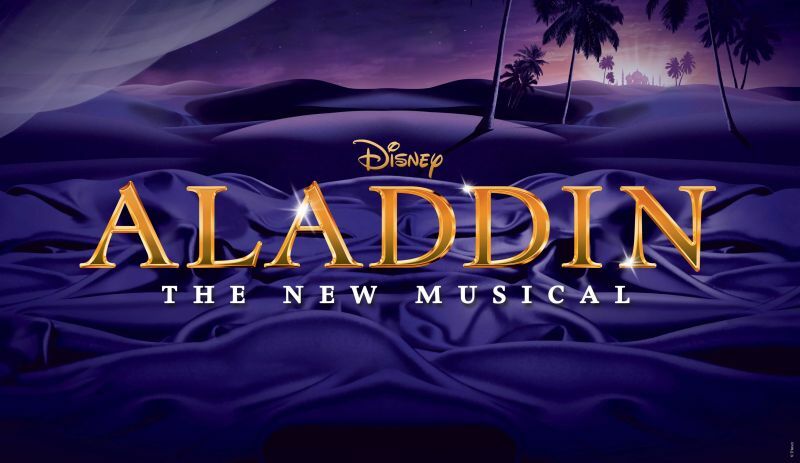 After deciding on our plans, I knew immediately that if we could afford it and could find last minute tickets, Aladdin was a must see Broadway show for my crew of Disney lovers! And boy was I ever right! Here are my 5 reasons that every Disney fan must see this show! 2. 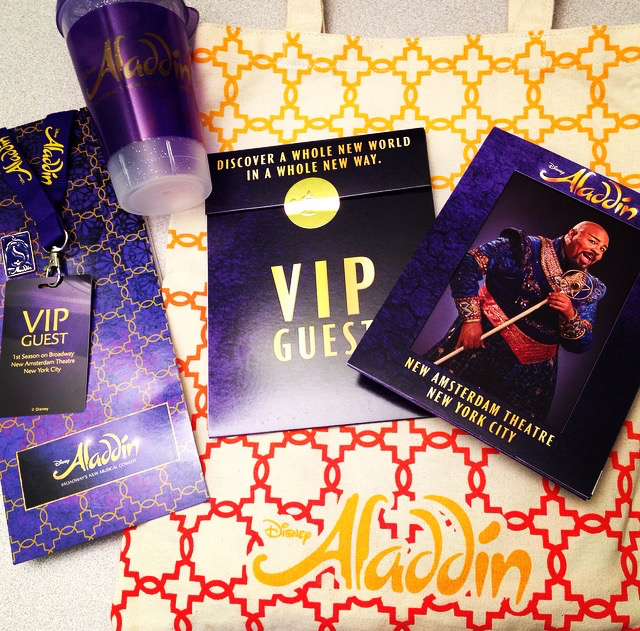 You must see Disney’s New Amsterdam Theatre! 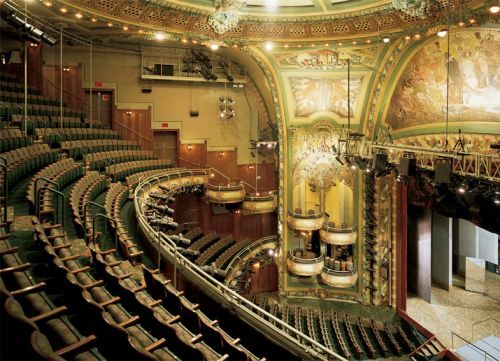 When we arrived at the New Amsterdam Theatre, nicknamed the “the house beautiful,” we knew we were in for a treat! The theater is absolutely breathtaking, built in 1902 in an Art Nouveau style of architecture, it has quite a colorful history. It housed many famous productions over the years, yet fell into decline after being used as a mere movie theater. The Walt Disney Company finally leased and renovated it in 1995, which also began a turning point in the rejuvenation of Times Square and the Broadway district as well. If you look at this picture, our amazing seats were second row on the left orchestra side. My 11 year old princess had the isle seat, boasting a completely unobstructed view of the stage. (Bar- high!) Sitting so close to the stage made us feel like we were actually part of the show! Many actors made eye contact with us and it was amazing to see the detail in the costumes. We still wondered how they accomplished many of the illusions that were performed so close to us during the show, we still could not figure it out even that close! 5. 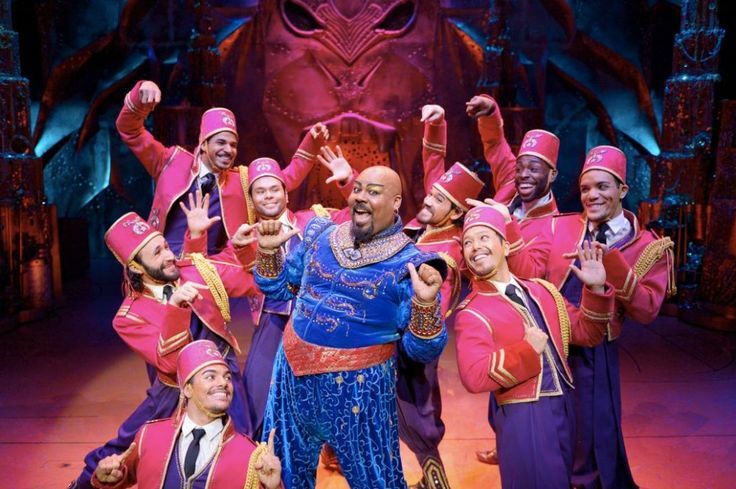 Lastly, you will love, love, love the amazing Genie, James Monroe Iglehart! The Genie steals this show, there is no doubt about it! He is funny, he is energetic, he is a talented singer and dancer, and he plays this part so well that you really want to go up there and sing and dance along with him! (But don’t, security frowns upon that, don’t ask me how I know.) Mr. Iglehart has not only won a Tony Award for this performance, but he has become the face of this musical, and all the accolades are well deserved believe me! You will find yourself wanting to stand and cheer every time he concludes a performance, yes, he is that good! So there you have it! 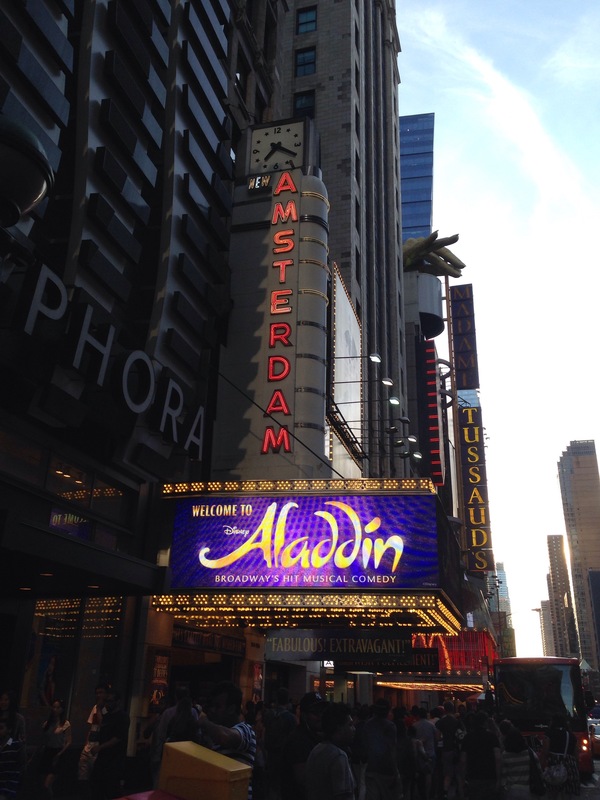 If you are headed to New York City, or even if you plan a special visit just to see this show alone, Aladdin the Musical is a must see! 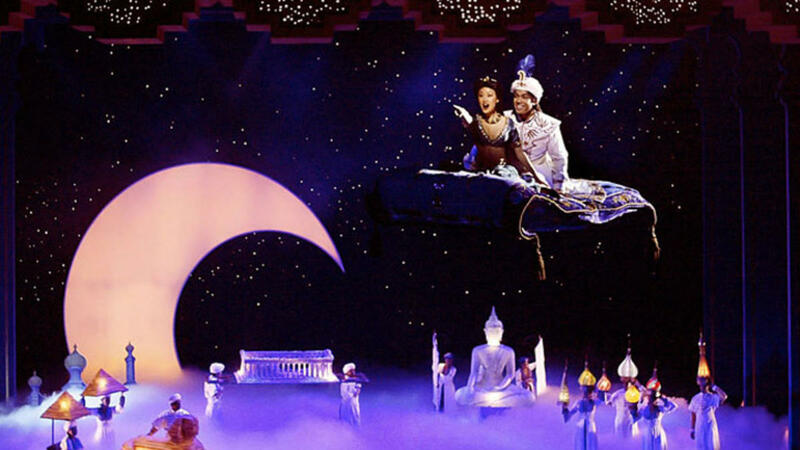 Make sure to arrive in plenty of time to get a picture in the lobby with the magic lamp, and take time to explore and see the beauty of Disney’s New Amsterdam Theatre! You will not be disappointed! Enjoy your visit to the fabled city of Agrabah, Salaam my worthy friends!